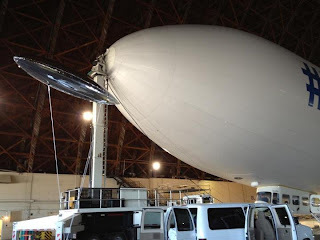 Hannes and Francis have headed up to the Cargo Airships in the North for Northern Operations Workshop that NASA and the state of Alaska are holding Aug 22-24 in Anchorage Alaska. The model is helping us conduct studies on the hull form (based on a speed record holding submarine) as well as the performance characteristics of a unique thrust control mechanism. The hull form influences efficiency -- either via speed, or fuel consumption. The thrust control mechanism should be as much an improvement in control authority over the Zeppelin NT, as the NT was compared to the best that came before it (the Skyship). We are examining the advantages these designs bring at a range of sizes, from small UAV, to a rigid design with a lifting gas volume of 20,000 cubic meters (the limit for commuter class airships), and sizes beyond (transport class airships). "Ellie?" reminds me of a Pixar movie. Anyway, I look forward to the possible development of this concept, whether it be by you or some folks in Friedrickshafen. 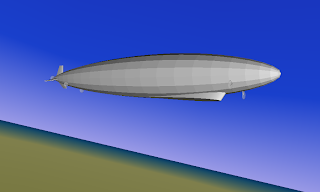 High-aspect-ratio airships seem like the future of LTA airships to me, as rotund hybrids encroach on their niches. The concept of that airship is quite simple but I guess it will look better when seen in action. Do you have other pictures of their cargo airships? I want to know how much is the shipping freight rates for this kind of shipping company.